On Thursday 7th July we welcome illustrator Jane Keay, who will be giving us a demonstration of her pen and ink work which is inspired by the Shropshire landscape. You can't find Jane's website HERE. We'll also be displaying the results of June's Monthly Draw topic, 'Carbon', and asking you to help us pick our next topic. Please arrive 7pm for 7.30pm, it's £3 for LAS Members, £5 for guests, £1 for students, and everyone's welcome! Tea, coffee and biscuits are available (for which we ask for a small donation of approx 50p). Hope you can make it! The entry forms for our 70th Anniversary Exhibition are now online! This month Spotlight shines on street art. ‘Vhils’ creates large murals throughout the world, imprinting the memories of cities into their walls. The works are about transformation of culture in an urban landscape that is always in flux, and showing that a city is its people, just as much as it is the changing bricks and mortar. 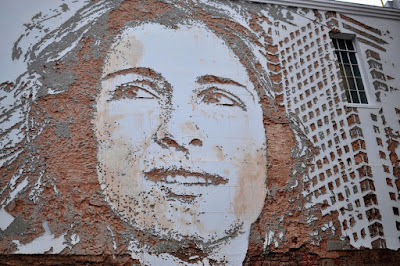 Vhils’ uses no paint or inks or paper or brushes…. Vhils scrapes away from what is already there. The images are scratched out of plaster and multi-layers of old paint on walls, and they are big. The images are made by removing paint and plaster to leave a poignant image, the size of a house or warehouse. ‘Ox’, like many street artists, reacts to advertisements in public spaces. Many street artists challenge the assumptions that only business art (advertisements) is acceptable in public spaces. 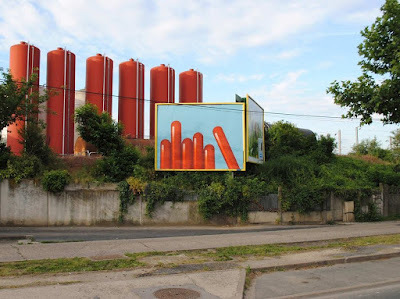 Ox changes public billboards to make them instead reflect the humour and dynamism of their surroundings. 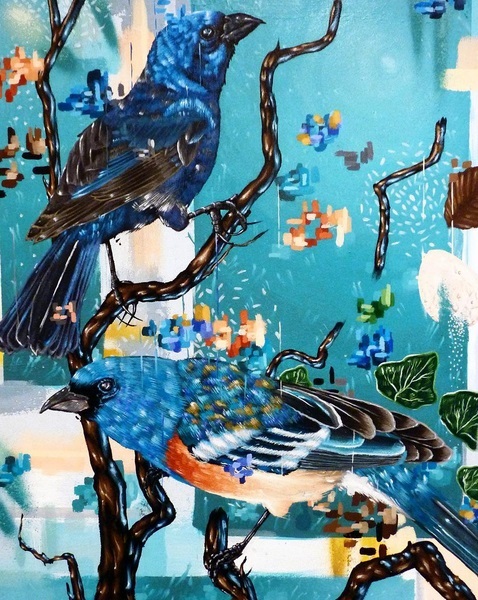 ‘Aspire’ mainly paints birds, celebrating the vibrancy of nature, and subtly hinting at the relative fragility of colours and diversity. By showing tropical birds there is a hint at how delicate their vast variety is. A great resource to find out more is ‘The World Atlas of Street Art and Graffiti’ by Rafael Schacter, published by Aurum press. If you want to see some street art being made, try ‘Upfest’ one of the UK’s top street art festivals. Upfest is a street art festival in Bristol, Banksy’s starting place, and home to a very vibrant art scene. The festival has 103 street artists. It is on in Bristol in July. Most of these artists’ works do not have titles. The birds here by Aspire, have been titled “The Vagrants” from when the wall-piece was entered in a street art competition, and needed a title to be made up for it for the catalogue, but otherwise Aspire’s works, like those of Vhils and Ox, generally are made without titles or names. If you know any great art websites or articles, why not share them here? Send your suggestions to matt.smart@mail.com - please not that this isn't for self-promotion! 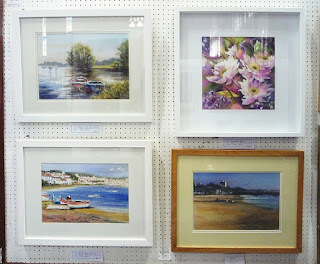 Over at the Ludlow library there's an exhibition on from Jane Elizabeth Cullum, who also exhibits in the Castle Gallery. You can see examples of her work on the Artists and Illustrators website HERE. Don't forget, our Fringe membership offer is on for one more week - it's 50% off for the second half of 2016, so if you know someone who's thinking of joining the LAS, now is the perfect time for them to sign up! 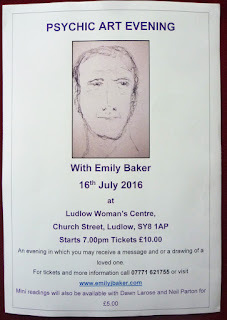 Artist-in-residence Teresa Albor invites you to come dance at St.Laurence's, Ludlow! Noon-13:00, Monday 27 June. As part of 3L! (three weeks in Ludlow) everyone, regardless of age or dancing ability is invited to a "silent" dance hour-- bring your own portable music device and headphones as we dance up and down the aisles-- each to our own drummer! For more info call 07889558746. Thursday 30 June is deadline day for entries to Exhibition 2016. Follow this link to access our on-line entry system: http://www.strettonfestival.org.uk/information-for-artists/. If preferred, you can download the forms for printing and submission by post. 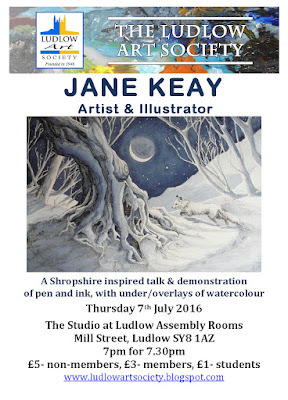 Paper copies are available at Barbara’s Framing, Scrappies and the Library in Church Stretton and at nearby art galleries. Please read carefully the Conditions of Entry - completing your entry form will indicate your acceptance. To ensure the security of the work on display, exhibitors are required to steward for three hours over the course of the Exhibition. If this requirement causes serious difficulties, please contact us at exhibition@strettonfestival.org.uk. You can sign up on-line: http://www.strettonfestival.org.uk/information-for-artists/. Or sign up at the front desk when you bring your work on Saturday 30 July. Or phone Sylvia Davidson on 01694 723842. Set up day: Saturday 30 July 2016 at Church Stretton School, Shrewsbury Road SY6 6EX, from 10am to 12 noon. 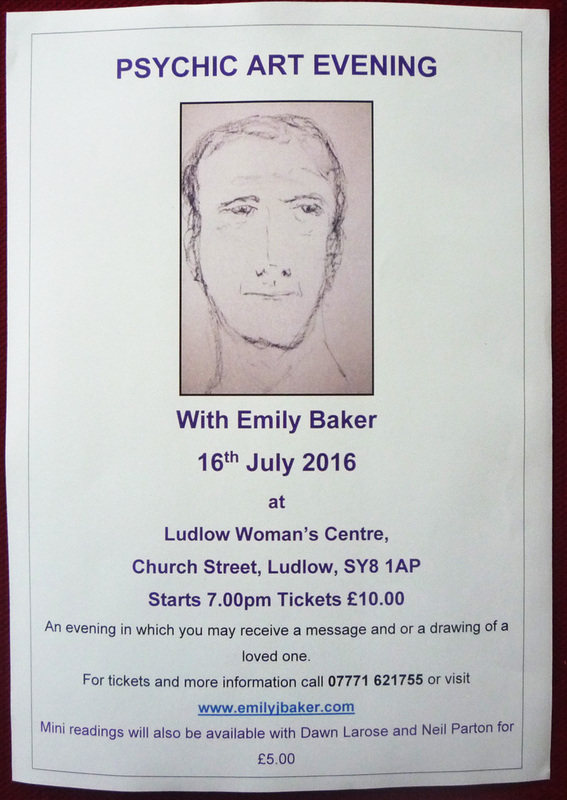 Opening night: Monday 1 August 2016, 7.30pm at Church Stretton School. Admission £2 to include a glass of wine or juice. 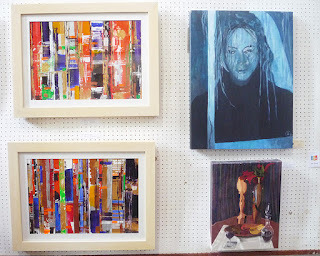 Exhibition: Tuesday 2 August 2016 to Saturday 13 August 2016, 11am to 6pm at Church Stretton School. Admission £1; free to children, students and exhibitors; free to all from 6pm to 7.15pm when there is an evening performance at the school. Collection day: Sunday 14 August 2016 at Church Stretton School from 10am to 12 noon. A change in procedures for collecting art work on Sunday 14 August means that we would appreciate extra volunteers between 9.30am and 12 noon on that date. If you are able to help, please let us know. For all queries and offers of help, e-mail exhibition@strettonfestival.org.uk or phone 01694 723072. We look forward to seeing you and your work this summer. We are looking for additional volunteers to join the organising committee for Exhibition 2017. If you have relevant skills to offer (event management, IT, publicity, etc) and might be interested in joining us, please contact us: email exhibition@strettonfestival.org.uk or phone 01694 723072.